Osteonecrosis is a condition in which death of a section of bone occurs because of a lack of blood supply to it. It is one of the most common causes of non-arthritic knee pain in older women. Women over the age of 60 years of age are commonly affected, three times more often than men. Osteonecrosis of the knee is most commonly seen in the femoral condyle, usually on the inner side of the knee (the medial femoral condyle). However, the condition can also occur on the outside of the knee (the lateral femoral condyle) or on top of the shin bone, the tibial plateau. The exact cause of the osteonecrosis of the knee is unknown. However, one of the theories suggests that a stress fracture or trauma results in altered blood supply to the bone. Another theory says that fluid build-up within the bone increases the pressure on the blood vessels resulting in decreased circulation. If the condition is not diagnosed and treated early, it can result in severe osteoarthritis. 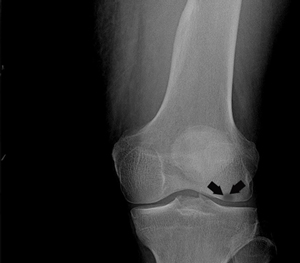 Certain conditions that are associated with osteonecrosis of the knee are obesity, sickle cell anaemia, lupus, kidney transplants, and steroid therapy. Osteonecrosis in the knee often results in sudden onset of pain and is often with a specific activity or minor injury. The pain often worsens with activity and at night. Osteonecrosis may also cause swelling of the knee. The knee may be sensitive to touch and pressure. There are four stages of development of osteonecrosis of the knee which can be distinguished by symptoms , X-ray and MRIs. Stage I: The symptoms are most intense in the earliest stage, and may subside in 6 to 8 weeks. In this stage, the X-rays are normal; a positive MRI may be required to make the diagnosis. Treatment for Stage I disease is non-surgical, focusing on pain relief and protected weight-bearing. Stage III: At this stage, the condition becomes clearly visible on X-rays and no other diagnostic tests are required. At this point the bone, itself, begins to wear away, and cartilage covering the bones loosens from other segments of the bone. Surgical treatments are usually needed at this stage. Stage IV: In this stage, the bone collapses further, and the joint space narrows. Bone spurs form, and the articular cartilage is destroyed. The only treatment at this point is joint replacement surgery. Surgical treatment is considered in the more advanced stages. Drilling the area of osteonecrosis of the knee has been trialed in the past with varying success. Unicompartmental or total knee replacement is the mainstay of treatment in advanced stages. Your doctor will discuss all the surgical options and recommend the one appropriate for you.